There is something to this formula director Peter Berg and star Mark Wahlberg have cooked up together. They've found a composition of elements that when brought together in their capable hands more than appeals to a large type of audience while simultaneously being thrilling and intelligent enough for the seasoned moviegoers to look past the standard genre elements they fit squarely into. This formula largely resides in the telling of American stories that focus on the little guy. The man's man who isn't sitting somewhere in an office with a suit on pulling the strings, but rather the men on the front lines. This is appealing to a whole region of the country not accustomed to seeing mirrors of themselves on the big screen in such big budget productions, but Berg and Wahlberg (lots of German ancestry going on here) have now told two sweeping stories concerning two "based on real life events" (and have a third coming later this year) that are more or less simple stories when taken at face value, but that permeate more meaning about the state of affairs in our country and world than a pointed essay about the state of affairs in our country and world ever could. This is how Berg captures his core audience and pleases his critics: he's able to say something boldly heroic about the men who risk their lives for others or perform in composed and exceptional manners when finding themselves in a set of insane circumstances while hinting at what this illustrates in the larger scope of things. In essence, it is those who are unassuming and voluntary in their heroics who continue to be the pulse of this country's integrity and not the house of governmental leaders or the big business tycoons who cut corners and jobs for their own personal gain. Thus the reason why the big business tycoon or better yet BP, AKA what was once known as British Petroleum, but changed their brand to that of "Beyond Petroleum" in the wake of the Deepwater Horizon oil spill, fulfills that role of antagonist here. Why that spill happened, which resulted in severe environmental, health and economic consequences, as well as serious legal and public relations repercussions for BP, happened in the first place is the story Deepwater Horizon is telling and much like their previous collaboration, Lone Survivor, Berg and Wahlberg tap into a real understanding for the value of life and that it is not worth throwing away for inconsequential details such as how many days past schedule one large oil and gas company might be. Mr. Jimmy (Kurt Russell) and Jason Anderson (Ethan Suplee) are consulted as to whether they believe their rig can continue drilling. Opening, effectively I might add, with playback of the Deepwater Horizon's Chief Electrical Engineer Mike Williams' testimony and his account of the situation that occurred on April 20th of 2010 when questioned about the emergency processes of an oil rig the size of Deepwater Horizon we are brought into this world immediately. I can always appreciate when a director utilizes every inch of their film and that Berg plays this choice piece of audio over the studio logos that contractually have to precede his movie tells us from the get-go that the man has a very clear direction in which he intends to take both his movie and his audience. As the credits fade and the first image comes onto the screen we are then introduced to the Williams we will get to know via Wahlberg. Married to his beloved Felicia (Kate Hudson) with which he has a daughter, Sydney (Stella Allen), that clearly adores him Berg sets up the family dynamic immediately. We are let in on the fact this is a routine the women in Williams' life have become accustomed to-cherishing their time with their husband and father to its fullest knowing he will have to leave for three straight weeks to be on the job again after no doubt feeling like he's just returned from his previous stint. The Williams' have a good thing going on and Wahlberg and Hudson do a more than commendable job of communicating as much as the two have some real, natural chemistry. This sets up the drive to return home that Williams will have when things begin to explode later on in the film, but before getting to that Berg takes his time in setting up Williams' connections that exist on the rig as well. We are introduced to Andrea Fleytas (Gina Rodriguez), a rig operator with a penchant for muscle cars as well as general operational supervisor, Jimmy Harrell (Kurt Russell), who is affectionately referred to throughout as "Mr. Jimmy". Williams has clearly known each of these individuals for some time as there is an ease and comfortability to their relationships that is immediately noted. The same is clear when they finally board the Deepwater Horizon and we glimpse the likes of drillers Dewey A. Revette (J.D. Evermore) Jason Anderson (Ethan Suplee), and Stephen Ray Curtis (Jason Pine), as well as floorhands Caleb Holloway (Dylan O'Brien) and Adam Weise (Jeremy Sande) and are witness to the type of freewheeling, but authentic relationships that are established between all of these people. We become invested in each of their individual stories and histories-Mike Williams simply being our way into this world that guarantees a happy, but scarred conclusion based on the facts of the matter. From the time Williams, Fleytas, and Harrell step onto the Deepwater Horizon it is made apparent BP is attempting to rush a process that needs to be carefully monitored. Berg even places himself in a role as one of the Schlumberger employees who were dismissed from inspecting the rig to demonstrate how early the crew of the rig were told of BP's corner cutting decisions. Needless to say, Berg doesn't care to paint BP in a forgiving light as not only does he cast the blame early and consistently, but he casts John Malkovich as Don Vidrine or who essentially serves as the face of the "company men" to blame for this disaster. Malkovich lathers on the thick Louisiana drawl making his seemingly evil intentions all the more obvious. This may be a little much considering how well the rest of the film seems to draw on reality for the events it chooses to depict, but Malkovich is such a presence on screen it's understandable why Berg would want to accentuate the antagonist in this situation. Vidrine is here to reinforce one idea and one idea only: that BP favored speed over safety and though this is likely true to some degree given the extremities with which Berg and Malkovich paints their evil villain one has to wonder how much they're bending the facts. This is one of the few shortcomings with the film overall though, as Deepwater Horizon is mostly a gripping and endlessly thrilling piece of cinema that spends its last forty or so minutes so consistently hammering the audience with explosions and the number of potential threats the crew must deal with on this massive freighter that it builds to a visually overwhelming feast. What makes this barrage of explosions and escape tactics worth investing in though, is the films allowance of time for us to get to know these men before the terror takes hold. With a screenplay credited to Matthew Michael Carnahan (The Kingdom, State of Play) and Matthew Sand (Ninja Assassin) the film takes us through a tour of the Deepwater Horizon via Wahlberg's Williams after he arrives on the rig for the first time in the feature. Treated to all of the different departments or cogs in the machine that keep this free-floating piece of behemoth architecture afloat 5,200 feet above the ocean floor displays the amount of collaboration needed to run the operation while at the same time spitting out banter that is genuinely funny and thoroughly accurate to the point of endearment that in many ways is unexpected in this genre of filmmaking. 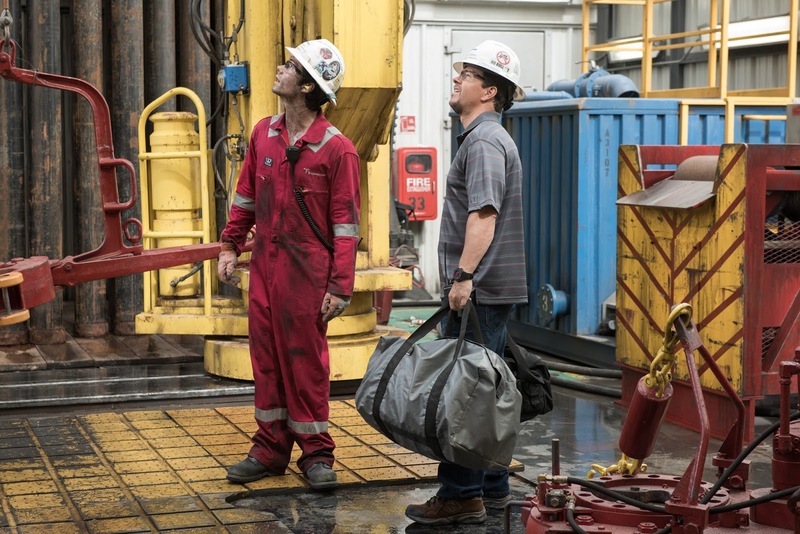 Floorhand Caleb Holloway (Dylan O'Brien) catches up Chief Electrical Engineer Mike Williams (MArk Wahlberg) on the state of the Deepwater Horizon. Wahlberg especially is a master of this everyman persona that is used to its seeming full potential here as his Williams is made to be this man of the people that we can trust because so many others who come by their money honestly do. Williams is a center point for which we can measure the likeliness of survival during the impending doom we all know is coming while also laying out the lines for the morally good and the morally corrupt. This banter that is anchored by an appealing Wahlberg performance gives the film an energy that keeps the tone light in its first hour while being very precisely undermined by composer Steve Jablonsky's consistently somber score. Despite all of the good vibes and safety awards given out (yes, there is a scene where BP execs present Mr. Jimmy with an award for the rig's safety record that is based in fact) we all know what is coming and it is in this pacing that Berg balances his emotional heft that is necessary when telling a true story audiences aren't too far removed from and will likely still resonate in more affecting ways for some depending on their connection to the events. When Berg finally jumps into the action-centric portion of his film it is relentless-and intentionally, even needfully so. The terror takes hold and doesn't care to let up until it seemingly knows the viewer has been beaten down. This intensity isn't for the purpose of wanting to wear audience members down though as it is more in service of the quest for survival that becomes priority number one for our embodiment of heroism in Williams. The film nicely incorporates his attachments to his fellow crew throughout this quest with Russell and O'Brien especially coming into play as compelling presences that not only guide the narrative to logical and hopeful places, but add that critical nuance of the human spirit and determination that make this formula Berg is cooking up a guaranteed winner. 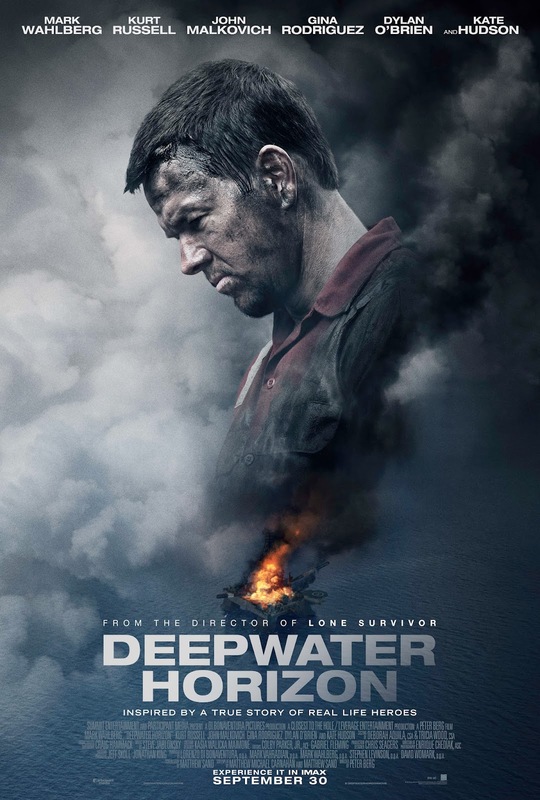 This is all to say that the film is a harrowing experience no matter what, but that Berg and his editors Gabriel Fleming and Colby Parker Jr. navigate these character tasks within the repercussions of the rig explosion so that there is an emotional weight lent the film that makes the harrowing action sequences that much more so. 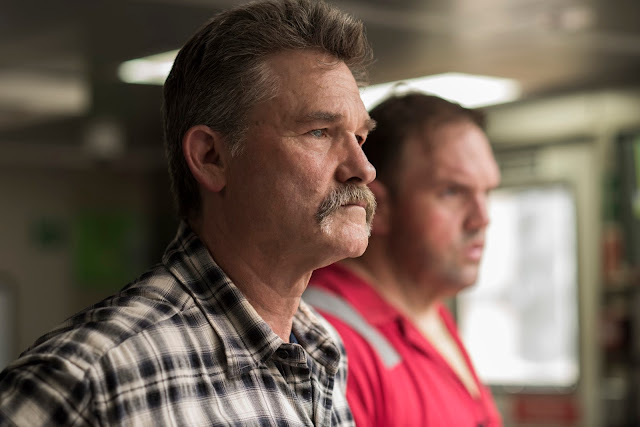 There are other cool facets to the film such as Russell's make-up post-explosion being terrific as well as the use of and absence of sound depending on the situation, but what will make Deepwater Horizon a film that goes down as much for its telling of a true story is the fact it takes that true story and doesn't just tell it, but tells of the men who lived it, survived it, and honors those who didn't while slyly begging the audience to evaluate the contradiction of this man-made disaster and how easily it seemed to happen when these characters we've come to know and like seemed so good at their jobs.